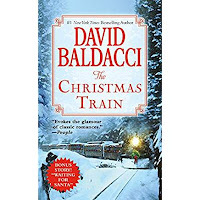 It’s been a while since I've blogged, but Christmas seems like a good time to say hello again, especially since I'd like to share some Christmas books you might enjoy reading. Christmas has always been “my holiday,” the one I just have to spend with family and other loved ones. And despite all the hassles of getting ready, I love the season—the lights, the music, the calls of “Merry Christmas” and “Happy Holidays.” It doesn’t matter which you say—the message of peace and joy comes through. “And it came to pass in those days, that there went out a decree from Caesar Augustus that all the world should be taxed . . .And Joseph also went up from Galilee, out of the city of Nazareth, into Judaea, unto the city of David, which is called Bethlehem. . . To be taxed with Mary his espoused wife, being great with child. . . .
Elin Hilderbrand writes delightful women’s fiction set on Nantucket, where she lives. Her Christmas series about the Quinn family shows how families can work our their differences because . . . well . . .that’s what family is all about. 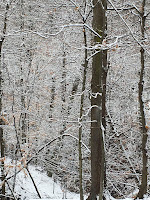 The books in the series are Winter Street, Winter Stroll, and Winter Storms. Nancy Thayer, author of the Hot Flash Club Series, also takes us to Nantucket in A Nantucket Christmas. 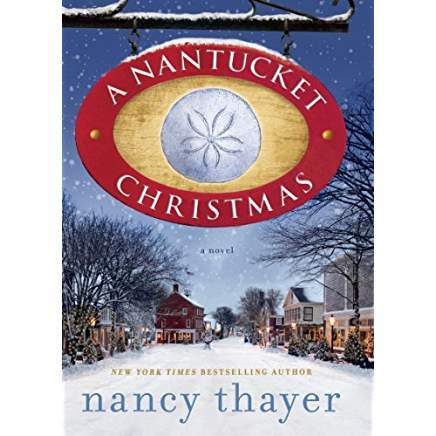 Recently married Nicole Somerset plans a wonderful family holiday, but she doesn't plan on the hostility of her stepdaughter, eight months pregnant, who arrives with her husband and son, determined not to enjoy Christmas at all. Kristin Hannah, who writes women’s fiction and historical fiction, adds magic to her mix in Comfort and Joy. The main character, Joy, is struggling to recover from learning that her two favorite people, her husband and sister, have betrayed her. She impulsively gets on a plane to head north. When the plane crashes, she survives and begins a life-changing adventure. Mystery writers Mary Higgins Clark and her daughter Carol Higgins Clark have a series about a former cleaning woman turned lottery winner who has become an amateur sleuth. I just read Dashing Through the Snow, where Alvirah and her cohorts go to New Hampshire for a small-town Christmas celebration and end up searching for a lost lottery ticket and a kidnapped young woman. But Christmas books aren't limited to female authors. Not to be missed is John Grisham’s Skipping Christmas, about a couple who decide to take a cruise for Christmas since their daughter won’t be coming home. Little did they know how many people that decision would offend. The book has been around a while and was even a movie, but it's still a fun read. 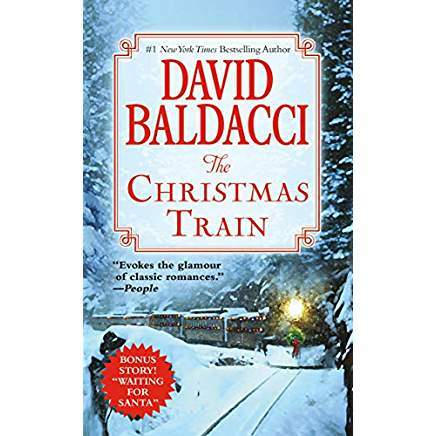 Also not to be missed is David Baldacci’s The Christmas Train. A former globe-trotting journalist boards a train to get from Washington, D.C. to Los Angeles to spend Christmas with his fiancé. However, the trip turns out to be more than he expected. He meets the “one that got away,”a former love he now realizes was the love of his life. Other characters are quirky and unique, and include a thief stealing small, valuable items from cabins. Add a blizzard and an avalanche and . . . .you get a great story. It was also made into a movie. 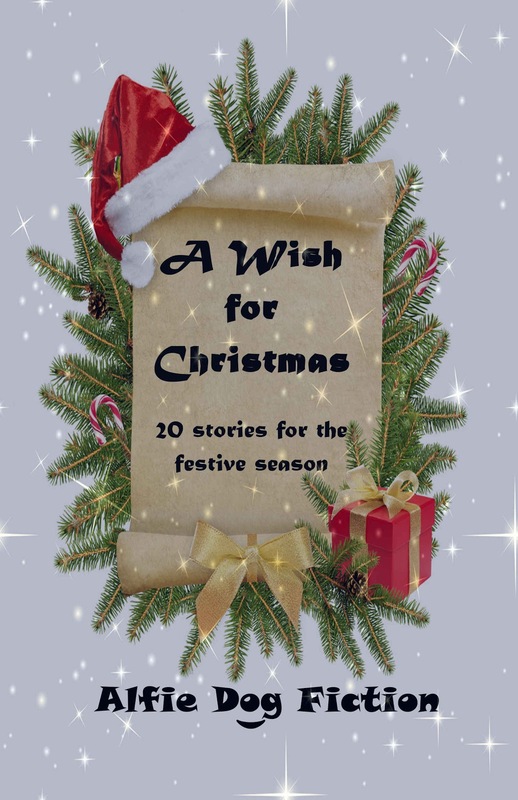 Last, I’ll add A Wish for Christmas, a collection of short stories from a small U.K. publisher. My story, “The Blue Christmas Tree,” is the final story in the book. 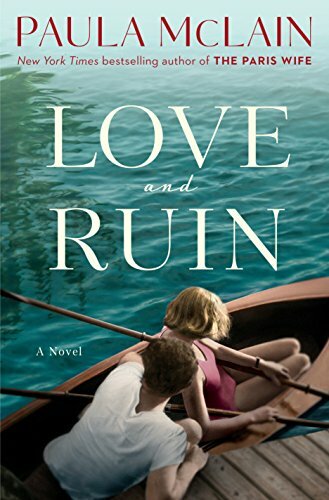 In my last blog I said I’d give Paula McLain’s latest book, Love and Ruin, its own post. McLain writes biographical novels that shine a light on little-known women. This latest book is about writer Martha Gellhorn. Gellhorn was born in St. Louis in 1908. She was an adventurer from the time she was a child and hid in an ice delivery cart because she wanted to see the world. The trip wasn’t very successful, as the cart just circled around and brought her back to where she started. But when she was older, Gellhorn did indeed see the world. She left college before graduating in 1927 to concentrate on a career as a journalist. She worked and wrote both at home and in France, but her life changed in 1936 when she met Hemingway in a Key West bar while vacationing with her mother and brother. They quickly became friends. She was intrigued to learn that he was about to leave for Spain to cover the Spanish Civil War, in which the elected government was trying to fend off General Francisco Franco and his army. Volunteers came from all over the world to help. Encouraged by Hemingway, Gellhorn decided to cover the war as well, and she and Hemingway made plans to meet if she could get over to Spain. Initially using fake papers and saying she was a correspondent, she did get to Spain where she joined Hemingway. They covered the war and also began an affair that eventually led to marriage. As a correspondent, Gellhorn covered the war differently from most of the male reporters. While they wrote about battles and statistics, she focused on what happened to ordinary people whose lives were ripped apart. Her stories featured women with no homes who had to stand in line for bread, knowing they and their could be children killed at any time, or on fathers searching desperately for their children. Back home, Gellhorn and Hemingway settled down together in Cuba, where she found a house in the hills, restored it, and for a few years lived her dream with Hemingway—two writers working under the same roof. In World War II, she lost her correspondent credentials when Hemingway, now her husband, offered his byline to her publisher. Their marriage was already having problems, and this only added to them. Still, she got herself to England and had a real scoop on D-Day. When the legal correspondents were on one of the invading ships, she stowed away on a hospital ship, which turned out to be the first to arrive at the Normandy battlefield. Gellhorn worked as a stretcher bearer, bringing wounded soldiers to the ship. No matter how much horror she saw, she never got used to it, never lost her compassion for the people she met, and never stopped writing about the human side of war. It is said that after their divorce in 1945, Gellhorn refused to have Hemingway’s name spoken in her presence. She wanted to be known as herself. 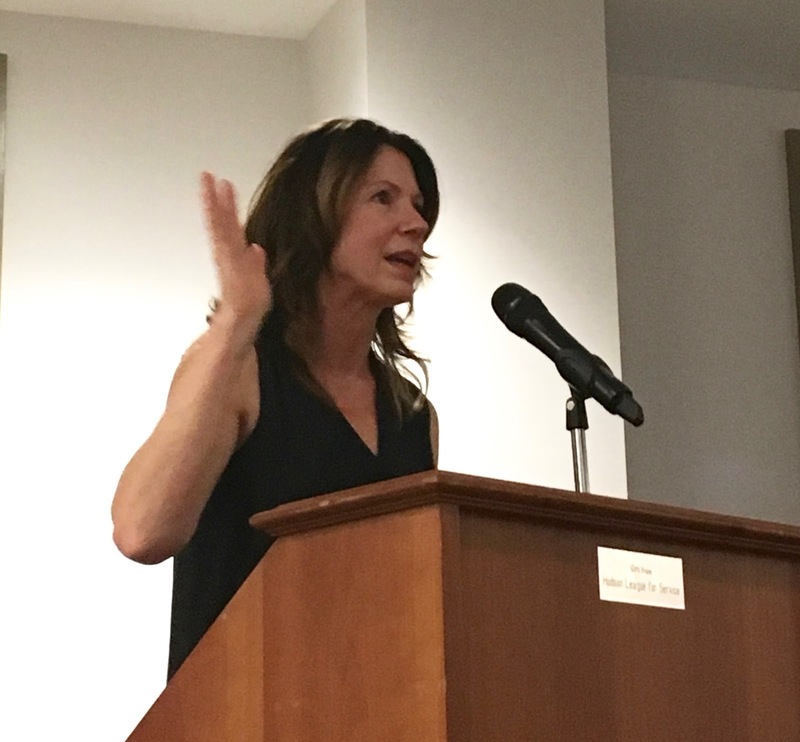 Paula McLain’s Love and Ruin is a good step in that direction. If you've read the book, I'd love to hear what you think. It’s been a long time since I’ve blogged, and I’m glad that my life has settled down so I can come back to it. I’ve missed reflecting on “reading and writing” and am looking forward to sharing my thoughts again. We’re spending the summer months this year in Northeast Ohio, not too far from the lovely town of Hudson. A great plus for Hudson is its fabulous library which seems to have something for everyone—not only books, CDs, and videos to enjoy, but quiet spaces for reading or writing, private rooms to work in, three different book clubs, meeting rooms, and a variety of programs, including an outstanding author series. Last week I was thrilled to meet best-selling author Paula McLain, most known for her three biographical novels—The Paris Wife about Ernest Hemingway’s first wife, Hadley Richardson; Circling the Sun about aviator Beryl Markham; and Love and Ruin about Martha Gellhorn, one of the twentieth century’s great war correspondents and Hemingway’s third wife. “I want to find little known women and shine a light on their lives,"she said, "so you feel you know them and have a better understanding of them and their lives.” By choosing to tell these women’s story in novel form, I think McLain accomplishes that goal by bringing them to life in a way that a strict biography might not. The books are in the “can’t put it down” category. When I went to her talk, I expected to learn about McLain’s life and books. I didn’t expect that she would be such a dynamic speaker, drawing her audience into her world. She spoke briefly about her childhood, telling us that her mother left when she was four, leaving her and her two sisters to grow up in California’s foster care system. After turning eighteen, she managed to support herself and go to college, eventually getting an MFA in poetry from the University of Michigan. Well, maybe not nobody, but she knew she wouldn’t make a living with poetry. By that time she was married and divorced with a two-year-old son, and worked several jobs, while also writing a novel. It was published, but didn’t sell well. Still, she knew she couldn’t stop writing—writing was who she was. Fortunately for McClain, she picked up the book A Moveable Feast, a memoir of Hemingway’s Paris years in the 1920s. Based on his manuscripts and notes, it was published three years after his death. McClain was “entranced” by 1920s Paris when so much was going on in the arts. Still a struggling writer, Hemingway partied, drank, and became friends with literary figures such as such as F. Scott Fitzgerald, James Joyce, Ezra Pound, and Gertrude Stein. That’s when McLain got her “big idea” to write about little-known women. Although Hemingway’s wife Hadley was mentioned only twice in A Moveable Feast, McLain wanted to tell the story of those Paris years through her eyes, the years when Hadley was loved and betrayed by Hemingway. Her agent asked her if she could write the book fast. Now remarried and the mother of three children, McLain sat in a Starbucks in Cleveland Heights, OH, and went to Paris in her imagination. She read Hemingway, immersed herself in the period, and took Hadley “out of the shadows.” She also managed to write the book in seven months! The rest, as they say, is history. The Paris Wife went on to be a best-seller, and McLain went on to write Circling the Son, a book about aviator Beryl Markham. She heard about Markham from a brother-in-law who was reading Markham’s own book, West with the Night. “I was hooked after the first few paragraphs,” McLain said. She told the world about this ground-breaking woman, raised in Kenya, who went from horse training to flying and became the first woman to fly solo across the Atlantic from east to west. Love and Ruin, about Martha Gellhorn, is McLain's most recent book. I just finished it and can only say thank you to McLain for shining a light on this amazing woman. I’m going to talk about Love and Ruin in next week's blog because Martha Gellhorn deserves her own post. 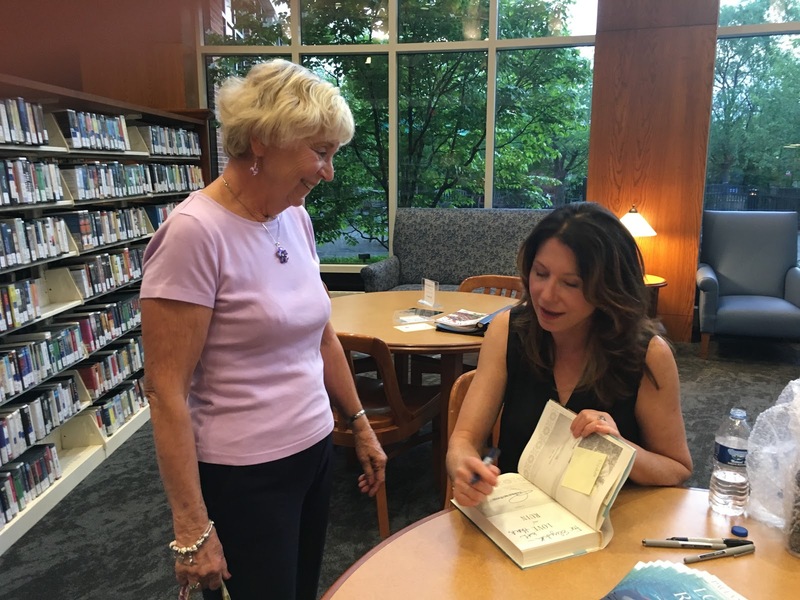 Have you read Paula McLain’s books? Do you have a favorite? new year with hope and optimism, a belief that things will get better. I decided to look for and post a positive/optimistic quote every Monday to keep me inspired. Sometimes we need to see what's good in the world—especially with so many negative and hurtful things being said and done today. I also decided I’d make my first blogpost of 2018 a positive one, too. So here's a heartwarming story. Last fall, I heard that our Daytona Beach Barnes & Noble had lost its lease and was going to close. I was terribly disappointed because every trip my husband and I take to Daytona ends with a stop at the book store. But it never occurred to me that I could do anything about it. MERRY CHRISTMAS — HAPPY HOLIDAYS !! On this Christmas Eve day, I'd like to wish everyone a MERRY CHRISTMAS and HAPPY HOLIDAYS ! Despite all the rushing around and hassles to find the perfect gifts, Christmas is a season of lights, hope, friendliness and smiles. We're visiting our son in the Cleveland suburbs for the Christmas. Not being familiar with the grocery stores, I ask a lot of questions. Everyone has been so helpful, especially when I say I don't live around here. Then they ask where I'm visiting from, and when I say Florida, we spend a few minutes discussing where I live and where they've visited. More people than I expected have heard of DeLand. Either they have a son, daughter, niece, or nephew who's gone to Stetson, or they know someone who sky dives at Deland's airport. The conversation always ends with mutual holiday greetings along with directions to the soup, stuffing, or egg nog. 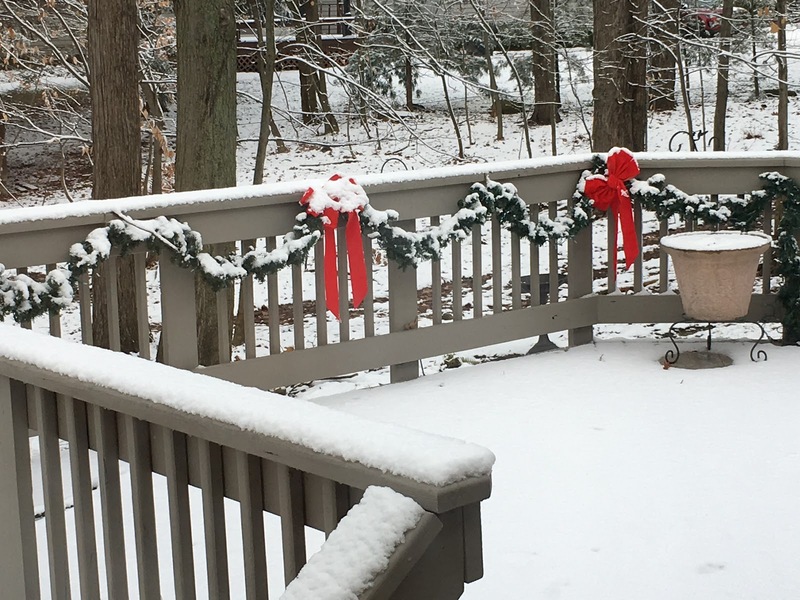 Adding to the season, we've had snow! 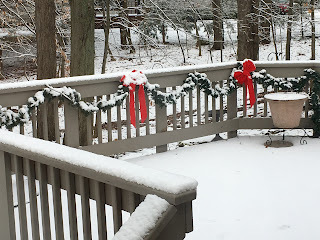 Much as I love Florida winters, I like it to be cold and snowy at Christmas. My fingers have been crossed for a white Christmas, and I've been rewarded. 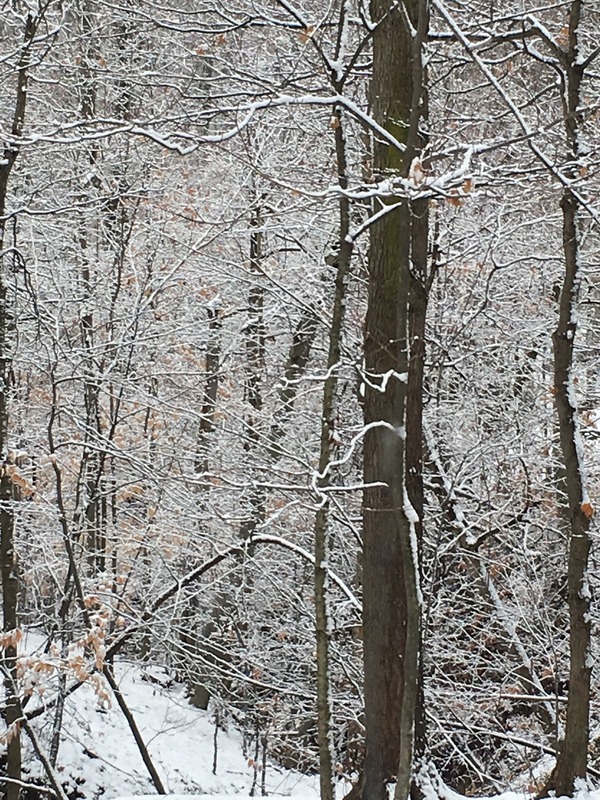 Here's a view of my son's back yard. And while I'm talking about a snowy Christmas, here's a link to a light Christmas romance I wrote a few years ago. It takes place on Christmas Eve and is about a country girl living in the city, her handsome date, and a Blue Christmas Tree. It was published by an online publisher in the U.K. called Alfie Dog, and is like a Hallmark movie in 1,000 words. I first featured it in a blog last year, December 13, 2016. As a added note, there are just a couple of days left for the special $.99 Kindle holiday pricing for PAIRS ON ICE and PAIRS AT NATIONALS. Just click on the book you want and to go to the Amazon page. MERRY CHRISTMAS, HAPPY HOLIDAYS, and HAPPY NEW YEAR !!! Here’s another interview with an author I know personally, Melody Dean Dimick. We met a few years ago when we were both working on novels for young people. We formed a critique group for ourselves and other writers to share insights and offer suggestions about our writing efforts. A former high school teacher, Melody began writing Young Adult novels after she retired. Her books show a rare honesty about the reality of teens’ lives. Blame is the third book in her Silent Series (the other two are Silent Screams and Sinister Silence) but its unique plot and main character allow it to be a stand-alone novel as well. 1. You were a teacher for many years. When did you decide you also wanted to be a writer? When I heard rumors about a murder and a cover up of the murder in my home town, I wanted to tell the murdered woman’s story. 2. Many adults have a rosy picture of teen life. I remember good times, yes, but also insecurities and worries. Where do I fit in? What do I want to do with my life? Will I have a date for the prom? 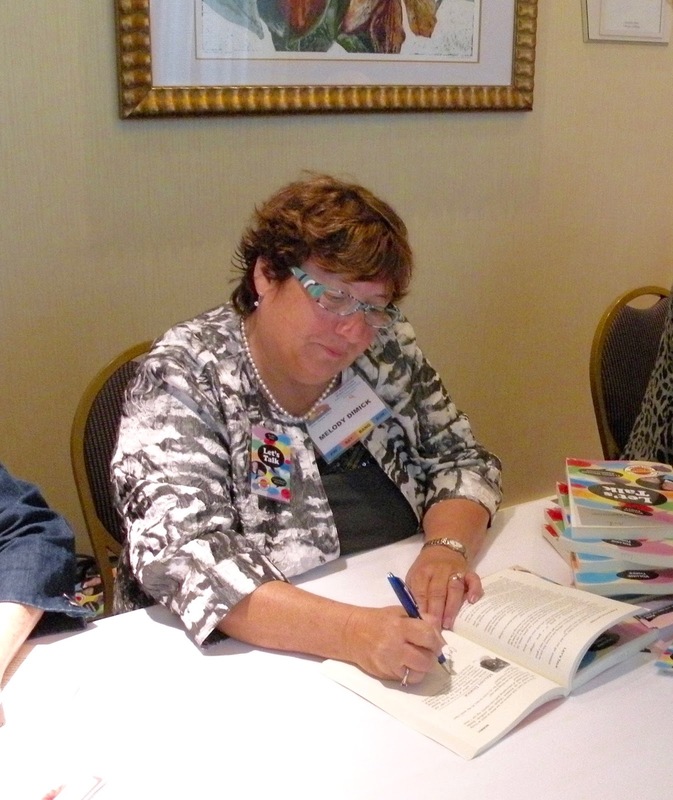 In creating your books, do you draw on your own memories or on your students’ lives? My characters’ experiences are a compilation of my memories and events I witnessed while teaching. 3. The main character in Blame is 17-year-old Jacob who discovers by accident that his father is hiding something that could destroy his family. He agonizes over what to do. What is the most important message you want your readers to take from this story? I’m bearing two messages: Even if it comes with pain, family is worth saving, and it’s important to have a friend or friends to turn to when times get rough. 4. When Jacob and his co-captain get into a fight and refuse to tell their coach why, the coach tells them to work it out. Should he have done more? No, the coach understood it was too painful for the boys to discuss what the problem was. It was too private and embarrassing. He gave them his card, so they could contact him when and if they were ready to discuss the reason for the conflict. 5. Jacob is obsessed with being clean and is constantly washing his hands to the point where they are red and raw. Why did you add this to his personality? Should his parents have encouraged him to see a therapist? This part of Jacob’s character is from me. I’m excessive compulsive about germs. I wash my hands until they peel. I kept hand sanitizer on my desk for students to use. One young man came up four or five times a period to clean his hands. Finally, I told him his hands were going to start peeling if he didn’t stop using so much hand sanitizer. He looked at his fingers and said, “Oh, is that why my hands are peeling?” Since I don’t think I need a therapist, I wouldn’t suggest it for teens. Part of my job at one school was to stand in the bathroom between classes to deter students from smoking or fighting in the bathroom. A shocking number of students did not wash their hands after using the facility. Since germs spread through hand contact, I’ve made it a habit to wash my hands more frequently than many others do. 6. You write about teens who are definitely not part of the “in” crowd? Why did you choose them over the popular kids? Popular teens don’t usually need an advocate. On the other hand, alienated kids need to know they are not alone with their problems. 7. Do you have a favorite character in your books? What do you like about him/her? I love all my characters, but Dallas, also known as Squirrel, dares to be different. She wears her own style of clothes, loves trees, and dares to stand up to bullies. 8. What part of the writing process is easiest to you? What is hardest? Brainstorming ideas, coming up with the what ifs, and choosing unique characters, is the easiest part of writing for me. The character arc challenges me. There’s an old cliché that states, “A leopard doesn’t change its spots,” yet writers must show character change. It’s difficult for me to write about measurable character change. 9. What kinds of books do you like to read? Can you mention a couple of your favorite books? I love to read books from every genre. Like most girls my age, I loved Carolyn Keene’s Nancy Drew series when I was in middle school. Rebecca, The Good Earth, She’s Come Undone, The Fountainhead, and Spoon River Anthology are among my literary favorites. If I’m heading to the beach to relax, I love to bring a Janet Evanovich book with me because she combines humor and mystery. My thanks to Melody for sharing her thoughts with us. Her books can be found on Amazon and also through her publisher, Taylor and Seale. And here’s a special note for SCBWI members—Melody will be on the First Books Panel at the January conference (Saturday at 11:45). If you’re there, stop in and say hello. Reading and writing have been part of my life since I was a child. I've published several short stories in magazines, four non-fiction books, and a collection of stories called Young Patriots: Inspiring Stories of the American Revolution. 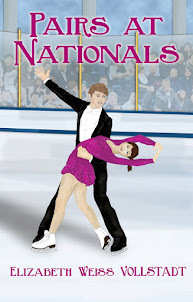 My latest book is Pairs at Nationals, a sequel to Pairs on Ice. After Jamie and Matt's coach is injured, they travel to another rink to train and find hostility and pranks. Jamie wonders if it's worth the struggle. Special Price, $.99 on Kindle! Click on image to learn more or to buy.